Helping guide pilgrims and draw newcomers to the feast were two new beautiful signs on Route 25A (St. Dionysios on one side, and the Protection of the Mother of God on the other), pointing the way the monastery. After serving All-Night Vigil the night before, and making many preparations together with the community of hardworking laymen and pilgrims, the monks and the people eagerly awaited the arrival of the two diocesan hierarchs, as well as the Kursk Root Icon of the Mother of God, which was accompanied by His Grace Nicholas, Bishop of Manhattan. Bishop Nicholas served the Proskomedia, while monastery abbot Archimandrite Maximos (Weimar) and the rest of the brethren awaited the arrival of His Eminence, Metropolitan Hilarion, First Hierarch of ROCOR. 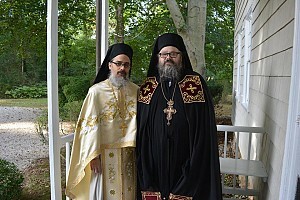 The Third and Sixth Hours and Hierarchal Liturgy followed immediately upon the Metropolitan’s arrival and vesting, and the monks were blessed to have not only their own clergy serving and singing that day, but also were very encouraged by the presence of the dean of Long Island & the Hudson Valley, Archpriest Alexandre Antchoutine (rector of Holy Virgin Intercession Church in Glen Cove, NY), serving and assisting at the altar. 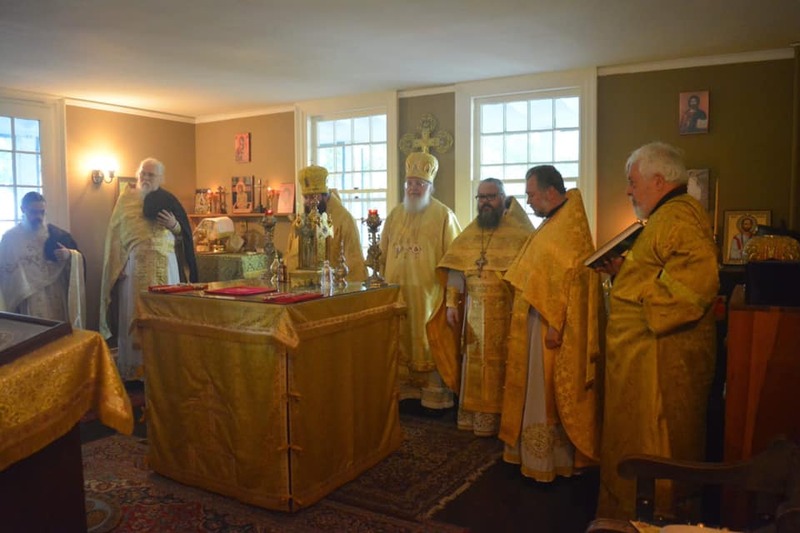 The Glen Cove parish, whose feast some of the monks served two days earlier in Glen Cove, is like a home away from home for the monks, and provides many occasions for mutual fellowship – especially now that the two patronal feast days are only two days apart (Protection of the Theotokos on October 1/14, and St. Dionysios on October 3/16), and also since icons of both now grace the monastery entrance. And so, together with them, the clergy and faithful of the Synodal Cathedral and St. Sergius Mission in New York City, as well as St. Seraphim Memorial Church in Sea Cliff, NY, and many other New York City and Long Island Orthodox of many different jurisdictions, the Brotherhood is surrounded by a host of wonderful and long-lasting friends! The monastery clergy concelebrated with Metropolitan Hilarion and Bishop Nicholas that day: Fr. Maximos, Archimandrite John (Ericksondeputy abbot Hieromonk Silouan (Justiniano), and Hierodeacons Michael (Wells) and Parthenios (Miller), as well as ), Fr. Alexandre. Chanting on the kliros were two other monks of the Brotherhood, Hieromonk Zosimas (Krampis) and Hierodeacon Daniel (Justiniano). Much assistance, greatly appreciated by the Brotherhood, was given by the Metropolitan’s driver, Reader David. In his sermon, Metropolitan Hilarion drew special attention to the Apostolic reading about the Holy Hieromartyr Dionysios the Areopagite (Acts 17), noting how Saint Paul was trying to speak to the Athenians about the Unknown God and the Resurrection of Jesus Christ, and yet many of them replied with dismissive words that mocked this strange doctrine of Paul; but Dionysius (an eminent philosopher and chief judge), together with Damaris and certain others, did not mock or scoff, but said, rather, "I want to know more," and listened and believed! After the sermon, a great blessing followed: the ordination to the diaconate of Monk Vasilios (Willard), now Hierodeacon Vasilios (whose family are natives of Smithtown, and who grew up in the area of the new monastery). He was led to and around the altar table by Hierodeacons Michael and Parthenios, and "Axios!" was proclaimed by the entire church upon his ordination. After the Communion of the clergy and the faithful, and the dismissal followed by many words of kindness and congratulations, the men and women of the local lay community (including many from afar) served a wonderful festal meal, both indoors for the bishops, monks, and clergy, and also outdoors under tents, with tables and chairs, for the people to relax and enjoy one another’s company in the beautiful weather we were granted that day. Heartfelt words were offered during the meal, among them the toast of Fr. Alexandre Antchoutine, who compared the recent experience of the Brotherhood of St. Dionysios to the larger ROCOR experience of "always living with your bags packed, but now being established in your own place." Hieromonk Silouan, Archimandrite John, and Hieromonk Zosimas, in turn, stood and offered thanks to the overarching Providence of God in the narrative history of the forming and sustaining of the Brotherhood of ten monks, and particularly their thanks to God for Archimandrite Maximos’ patience and discernment and longsuffering guidance and oversight that helped up, together with Metropolitan Hilarion, to get them all to this newly established place. 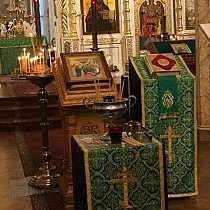 In short, the monks are thankful to the Lord Jesus Christ and His Most Holy Mother and St. Dionysius the Areopagite, and the beloved hierarchs of ROCOR and her clergy, and all of their Orthodox brethren, for allowing the Brotherhood to now have a sense of belonging, a sense of permanence, together with hopeful and fruitful possibilities for their future, in a place that they can finally call "home." 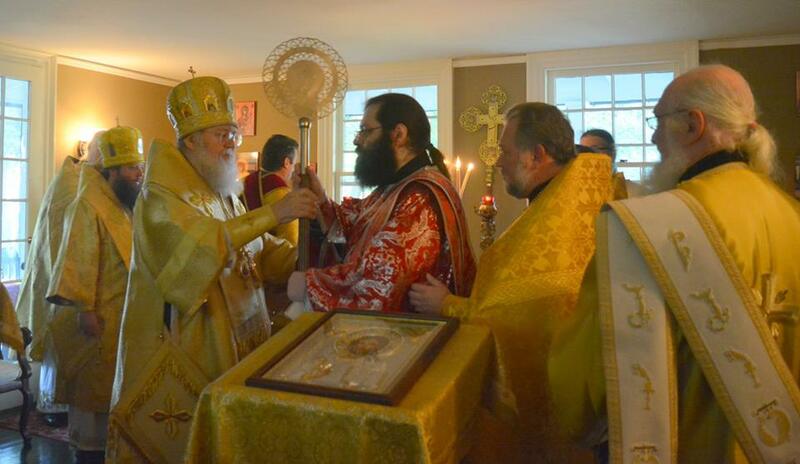 In honor of this new home, "St. James, New York," the abbot and Brotherhood presented Metropolitan Hilarion with a small, silver censer from Compostela, Spain, on the silver of which stand are depicted an icon of the Holy Apostle James, and whose silver base is in the image of a seashell, in memory of St. James (and also the symbol of St. James, NY). 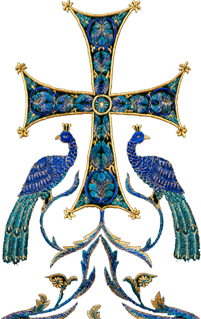 Another special thanks was offered to His Grace, Bishop Nicholas, whose decision to leave the Kursk Root Icon with the monks overnight made possible their visitation of a fellow monk, Fr. Cornelius, bedridden at the local Rehab Center, after a month-long stay in the hospital. Their Brotherhood prays that their community of monks at the Monastery of St. Dionysios will continue by the grace of God to contribute to the work of Christ and His Church, and the Russian Orthodox Church Outside of Russia, and particularly to the growth of monasticism in our land. They likewise thank all of the hierarchs, clergy, monastics, and laypeople who have made this feast and this monastery possible.